318 pages | 24 B/W Illus. The UK Independence Party (UKIP) is the most significant new party in British politics for a generation. In recent years UKIP and their charismatic leader Nigel Farage have captivated British politics, media and voters. Yet both the party and the roots of its support remain poorly understood. Where has this political revolt come from? Who is supporting them, and why? How are UKIP attempting to win over voters? And how far can their insurgency against the main parties go? 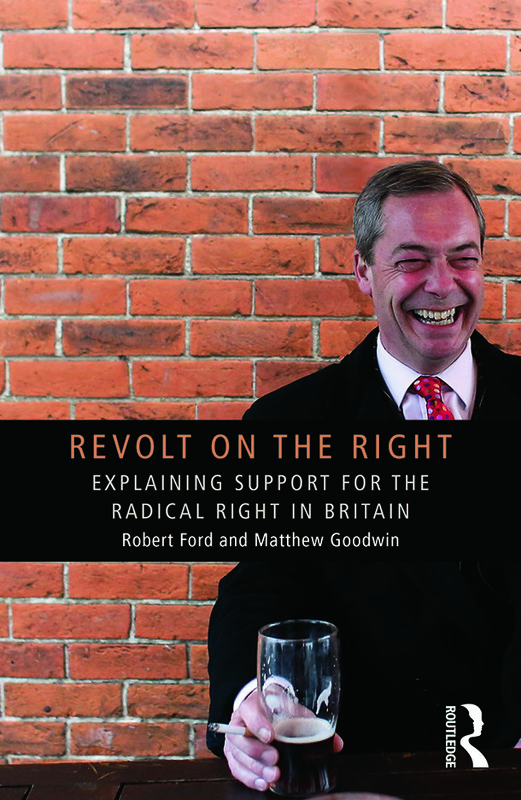 Drawing on a wealth of new data – from surveys of UKIP voters to extensive interviews with party insiders – in this book prominent political scientists Robert Ford and Matthew Goodwin put UKIP's revolt under the microscope and show how many conventional wisdoms about the party and the radical right are wrong. Along the way they provide unprecedented insight into this new revolt, and deliver some crucial messages for those with an interest in the state of British politics, the radical right in Europe and political behaviour more generally. Winner 'Political Book of the Year', 2015. One of The Guardian's Top Politics Books in 2014 - 'A sparky academic study of the rise of Ukip'. "Revolt on the Right is a rich and insightful dissection of Britain's first new major political force in a generation. Ford and Goodwin combine rigorous yet accessible statistical analysis of UKIP's supporters with unprecedented access to party activists and leaders. They paint a detailed portrait of the social forces driving UKIP's emergence and how the party itself has developed to mobilise a new mass electorate. This book is essential reading for anyone looking to understand this fascinating, and potentially disruptive, new force in British politics." Anthony Heath, Emeritus Professor of Sociology, University of Oxford, and Professor of Sociology, University of Manchester. "Revolt on the Right is not just a timely and fascinating book; it is also an important one: the first detailed study of one of the most significant developments in modern British politics – the rise of UKIP, which not only taps into popular discontent with the European Union, but has emerged as Britain’s first major non-toxic party to the right of the Conservatives." Peter Kellner, President of YouGov. "An essential analysis of the phenomenon that is UKIP in the run up to the 2015 General Election. Vital for anyone studying modern British politics seriously." Ben Page, Chief Executive of Ipsos MORI. "As the first serious study of the biggest challenge to the political status quo in 30 years, Revolt on the Right will be hard to better. It is both a garish picture of what the British right looks like when it has had one beer too many, and a sympathetic and occasionally touching account of the frustrations of the white working class voters progressive culture and conservative economics have decided they can do without." Nick Cohen, The Observer. "A forensic insight into the explosive rise of Britain's radical right, packed full of compelling research and first-rate analysis. A must-read for all those interested in the state of modern Britain." Owen Jones, columnist for The Independent and author of CHAVS: The Demonization of the Working Class. "This is an outstanding contribution to understanding contemporary politics: a rigorous assessment of the attitudes and demographics of UKIP voters as well as a brilliant story of the people and feuds behind the disorderly rise of a popular movement." John Rentoul, Chief Politicial Commentator, The Independent on Sunday. "UKIP – a quixotic project to transform UK politics or the catalyst for partisan realignment? Read Ford and Goodwin’s comprehensive and expert analysis before trying to resolve the question." Professor Michael Thrasher, The Elections Centre, Plymouth University, UK. "This book presents an insightful and highly informative analysis of the most significant independent challenge to the existing party system in England. It is a must read for anyone interested in the future of British politics." John Curtice, Professor of Politics at Strathclyde University and a research consultant for ScotCen Social Research. "The book is rich in analytical data and contains the occasional anecdotal gem." Kiran Stacey, Financial Times Political Correspondent. "Revolt on the Right is a must-read book for all politicians of the main parties as well as the political commentariat." - Keith Simpson, Conservative MP for Broadland and PPS to the Foreign Secretary. Robert Ford is Lecturer in Politics in the School of Social Sciences, University of Manchester, UK, and tweets @RobFordMancs. Matthew Goodwin is Associate Professor in the School of Politics and International Relations at the University of Nottingham, UK. He is also Associate Fellow at Chatham House and tweets @GoodwinMJ.